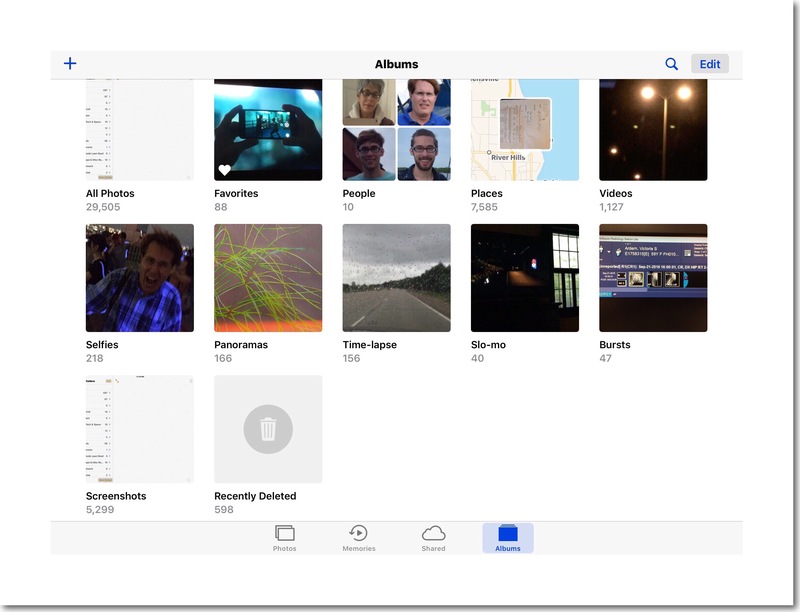 Displayed above: a new feature in ios 10…found via the Memories Tab discussed further down. I do all my work on iPads and usually use 2 or 3 at a time the way others use multiple monitors…I can’t afford to be without at least 2 functioning iPads at any given time. I didn’t always have so many…ios 8 was the turning point. When both my iPad Air and iPad mini ended up with corrupt versions of ios 8 I had to get new ones to keep working until I had time to copy all the content on them that wasn’t iCloud based therefore being backed up by iCloud. You can read more about my problems with ios 8 here. How Many iPads Do I Have? The only reason I’m including this section is because surprisingly I get asked this ALL THE TIME! I’m not entirely sure why…but it does seem to bug some people…especially relatives who’d like me to give them an old iPad, or who think I’m just playing around because they’ve never actually read my blog…you know who you are :-/ But I don’t get rid of them…I keep and reuse them as backups or for a dedicated purposes. So, this is approximate because it’s always changing…but right now I have 2 iPad Air 2’s, one original Air, one mini Retina, one mini 3, and 2 iPad Pros…the 9.7″ and 12″ model. I was secretly hoping of course that ios 10 might fix the corrupt problem too…the jury is still out…but I think it may have! My Photo Albums Have All Disappeared!!! Immediately following the upgrade I opened the Photo’s app to look for something. I was surprised to see that ios 10 includes 2 new smart albums…people and places…as well as a new menu tab at the bottom entitled Memories. 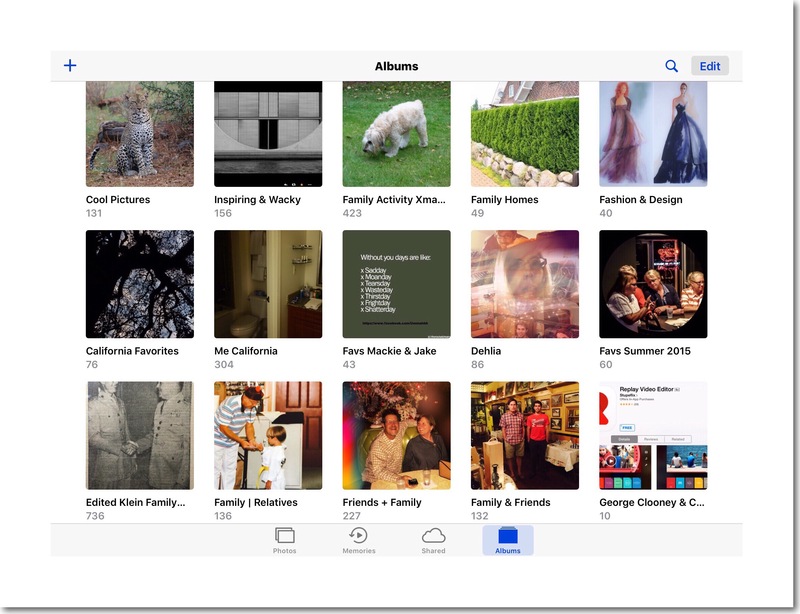 I was also pretty shocked to see that Apple appeared to have replaced all my photo albums with the new ones! Below is a screenshot of what I found upon opening the Photo’s app. I Found Them…Almost By Accident!!! I tapped around everywhere while holding my breath in the hopes that Apple hadn’t done away with all of my former Albums. My photo albums are still there! Initially, I couldn’t see them anywhere nor could I find some hidden area where they might be. After searching Google I realized there weren’t a lot of other people asking about this in forums or writing about missing albums, so I decided to search within the Photo app again. I still didn’t find them. I tried every single menu item yet again as well as swiping right and left anywhere and everywhere. Suddenly the new ios 10 albums slid up just a little bit…revealing my former albums (shown in the screenshot above.) Apparently, I’d accidentally tapped or swiped somewhere on the screen to make this happen…probably I swiped up a little bit as I was swiping sideways. I don’t know why I hadn’t tried swiping up and down…it’s just not a very intuitive move on that particular screen. But now I know…that the way to find the missing albums is by swiping up in the Photo app. I was completely and utterly relieved (I really can’t emphasize this point enough!) because Apple had done some things in the past that had permanently messed up all of my photos & photo albums…necessitating that I spend countless hours rebuilding & restoring my former organization. After breathing a huge sigh of relief and knowing that I didn’t have to worry anymore, I began exploring the new smart albums and the new Memories tab. All three new features are really great. You can read more about them in CNET’S thorough post. This entry was posted in Apple, ios, Tech Tips and tagged Apple Photos, ios 10, missingphotoalbums. Bookmark the permalink. Weird. Mine disappeared recently too. iOS 10.2.1 on my iPhone 6. I didn’t have any changes to my phone or iOS since My Albums were last seen. But trying to go to them in order to add some new photos, and I was surprised by the fact they were all gone! I still have all of my photos, my shared albums, and the normal iOS 10 albums. But My Albums weren’t below the iOS 10 ones. So, I created a new one to see where it would go. And sure enough, it went below the iOS 10 albums. But that new test album was the only one under My Albums. So, it looks like I’ve lost mine. Don’t know what happened, though. That’s really bizarre! Thanks so much for commenting here. I’m going to research that a bit and see if others have had similar experiences. I really appreciate your taking the time to comment! I’m sure I’d swiped up in the photo ap and there was nothing but after reading this article I went on and everything was there again!!! Thank you! I hope it worked for you! Thanks so much for taking the time to comment.